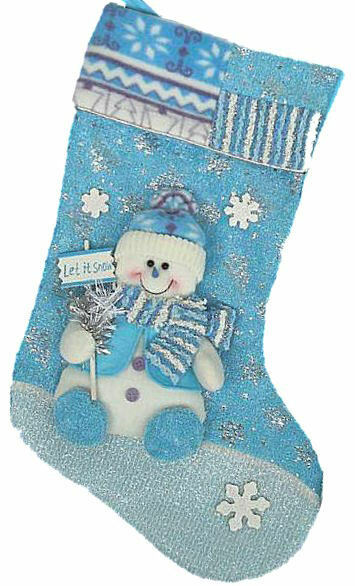 Gorgeous Blue and Silver Designer Collection Snowman Christmas Stocking. Names can be personalized on the cuff of this Christmas stocking with Silver or Lavander Metallic embroidery thread to compliment the color of the stocking. We have a sample picture of the stocking monogrammed with our gorgeous metallic embroidery thread ... click on the thumbnail image in the top right hand corner of this page to see a larger version. What if I need more of these Christmas stockings in the future years? This is a special seasonal designer stocking ... so once we sell out of existing inventory on these stockings, they will be gone.